Viburnum is a shrub that provides plenty of colour and interest in the garden. It has attractive foliage, delicate flowers, stunning autumn colour and clusters of bright berries and so offers year-round interest. There are many varieties to choose from, so you can find the perfect variety for your garden. Viburnums are large, flowering shrubs that come in many varieties. 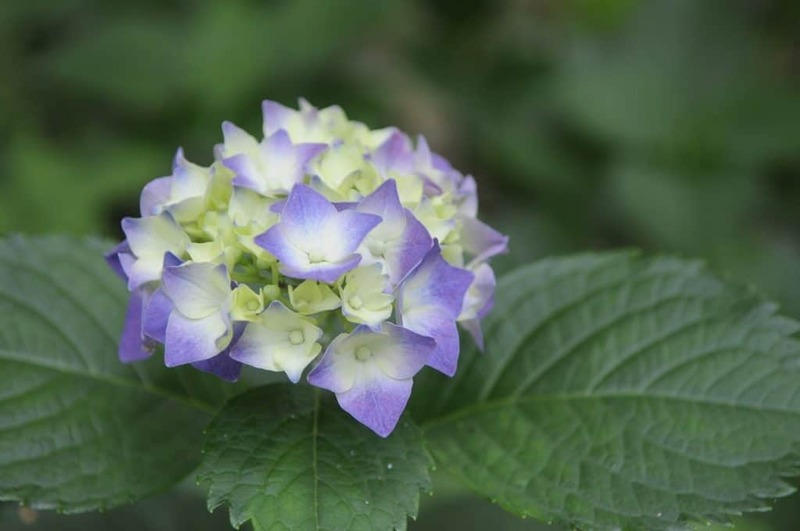 Many of them flower in winter or early spring but some bloom in early summer. 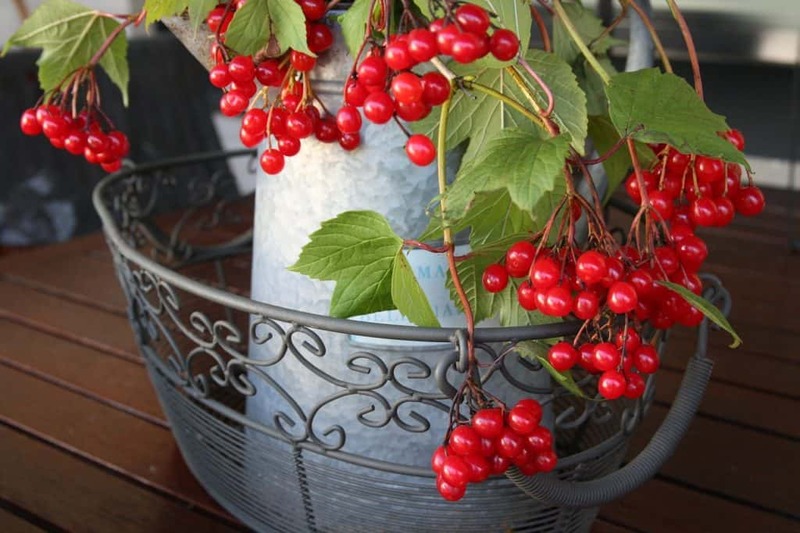 Different varieties are sometimes referred to as the cranberry bush, snowball bush or guelder rose. The shrubs have an attractive growth habit with many having horizontal or arching branches. There are both evergreen and deciduous varieties. Most have white or pink blooms in early spring. Many types produce abundant berries, varying in colour depending on the variety, which are loved by birds and other wildlife. The shrubs are often used in mixed borders or as hedging or screening. They also make great specimen plants. It is important to choose your viburnum carefully as varieties can range in height from dwarf specimens to giants of 20 feet (6 metres). Viburnum is reliable and easy to grow and can tolerate some shade, making them an excellent choice in the garden. This article will explain how to plant and care for these wonderful shrubs and offer advice on which varieties to choose. The shrubs are susceptible to certain pests and diseases, so this article will outline these potential threats and ways to prevent your viburnum from falling prey to them. There are many varieties of viburnum, so it is important to check each variety’s details to ensure you pick the one most suitable for your garden. For example, you can expect some varieties to reach a height of 15 feet (4.5 metres) and grow up to 8 feet (2.5 metres) wide. This is one of the smaller varieties reaching a height of only 3-6 feet (90- 180 cm). It features large clusters of pink, fragrant flowers. The plant is deciduous, and the dark green foliage turns bright red in autumn. American cranberry reaches 8 to 10 feet (2.5- 3 metres) in height. However, there are more compact varieties that only grow to 6 feet. This variety produces red, edible fruits in autumn. This variety can tolerate partial shade. It has attractive blue berries in the autumn which contrast with leaves that change to a dramatic purple-red at this time of year. It reaches 6-15 feet (2- 4.5 metres) tall and has white flowers. Commonly known as the Guelder rose, or snowball bush, this variety, as the name suggests, produces large, round clusters of white flowers. It also has scarlet fruit in autumn. One of the larger types it can reach heights of 15 feet (4.5 metres). This is a variety that is very popular with gardeners for its attractive blooms. This is one if the largest varieties and can reach 30 feet (9 metres) though it usually tops out at around 15. It produces white flowers and black berries. This shrub can tolerate some shade and thrives in most soil types. It is tough and drought hardy. Burkwood is an Asian variety that is prized for its delicious fragrance. This large dense evergreen will produce pink to white flowers from April to May, followed by red berries that darken over the course of summer. Burkwood will typically grow 8-10 feet (2.5- 3 metres) tall. It is reasonably tolerant of heat, drought and pollution. A very attractive variety, doublefile produces beautiful large white clusters of lace cap flowers in spring. Its dark green leaves turn burgundy to purplish red in autumn. It can reach heights of 8-12 feet (2.5- 3.5 metres). It also has attractive red berries in autumn. As viburnum varieties differ so much it is important to read the care label for your chosen type for specific details. For example, while most types prefer full sun there are varieties that will tolerate shade. However, in general, choose a location that gets plenty of sun and, ideally, has fertile, well-drained soil. Viburnum should be planted in the spring or autumn. They should be positioned between 5 and 15 feet (1.5 – 4.5 metres) apart depending on their predicted mature size. However, if you wish to create a hedge this planting distance can be reduced to 3 feet (90cm). Dig a hole as twice as deep and twice as wide as the root ball. Mix some organic material with soil and partially fill the hole before setting the plant in with its root ball level with the ground. Fill the hole with soil and firm down to remove air pockets among the roots. Water well and continue to water regularly, at least every ten days, for the first 6 months to a year until the plant is well established. Apply several inches of mulch to the plant, keeping it out of direct contact with the base of the shrub. This will suppress weeds and help the plant to retain moisture. Most viburnums do best in full sun and will flower well in this position. However certain varieties, including Blackhaw and Arrowwood can cope with partial shade. The shrub will require watering during dry spells although some varieties, such as Blackhaw cope well with drought conditions. Applying a mulch will help to retain moisture. Viburnum is not particularly fussy when it comes to soil conditions. They will do best, however, in fertile and well-drained soil. Your viburnum may benefit from an annual dose of slow-release fertilizer applied in spring. In general, these shrubs require little pruning. However, you should remove any dead, diseased or broken branches if they occur. In addition, pruning overcrowded branches or those that are rubbing together can increase air circulation and help prevent disease. You may also like to prune your viburnum to improve its shape, or if you are creating a hedge. With young shrubs, you can guide their growth by choosing an attractive upright stem and then pinching out some side shoots to create a balanced, open plant. You can them maintain your shrub by cutting it back just above the leaf nodes as required. Cutting the shrub back by a third each year will not harm it. It is best to prune after flowering to ensure you do not lose the following year’s blooms. If you have a particularly unruly shrub you can rejuvenate it by pruning it back hard. Cut the plant close to the ground, removing any weak or thin branches and leaving the sturdier stems to grow back. Don’t do this too late in the year though because the plant will need to put on new growth before winter. Propagating viburnum by seed is a long process as they take up to 18 months to germinate. For this reason, most people propagate the plants by means of layering or softwood cuttings. Layering is the simplest method. In spring, select a low lying young stem and bend it to the ground. With a sharp knife scratch away a 2 inch (5cm) section of the bark on the underside of the stem. You can then weigh the stem down with a stone, or bury it in the soil. New roots will have formed in 6-8 weeks and you can then cut away the stem connecting your new plant from its parent. The new plant can then be potted up ready for transplantation to the garden at the end of summer. You can also propagate viburnum by taking softwood cuttings in late May or early June. This should be done early in the day when the plant is full of water. Choose a non-flowering shoot as this will root more easily. Using a clean, sharp knife, cut 4 inches of shoot just above a bud. Remove the lower leaves and pinch out the tip. Dip the base of the stem in rooting hormone. Prepare a pot of compost and then make a hole for the new stem with a dibber or pencil. Insert the stem up to the first pair of leaves. Water lightly. Cover the pot with a plastic bag or place in a propagator in a bright place but not in direct sunlight. The cuttings should have rooted in about 6-10 weeks after which you can gradually harden them off. Viburnums are generally tough and easy to look after. However, there are a few pests and diseases that can damage their health and prevent them from looking their best. Often these pests and diseases can be kept at bay by providing optimal conditions for your shrub. However, if they become a problem, most are relatively easy to deal with. Viburnum leaf beetles are a recent threat to these shrubs that were once fairly resistant to most pests. The larvae of these insects can virtually destroy the leaves of your plant. The best thing to do is plant a variety that is resistant to this insect. If your plant comes under attack, then it pays to step in as quickly as possible. The larvae of the beetles are easiest to deal with before they get too much of a hold. If you prune off affected areas, i.e. any with eggs on the undersides of leaves, you may be able to prevent the problem becoming serious. A seriously affected plant may require spraying with synthetic pyrethroid pesticides. Do not apply these when the plant is flowering though, as it may harm pollinating insects. Introducing beneficial insects such as lacewings and ladybirds can also help. Aphids do not cause considerable damage to viburnums. However, they can cause unsightly curling, puckering and yellowing of leaves. Luckily the problem pests can usually be effectively removed with a steady jet of water. An insecticidal soap may be necessary if the problem is extensive. However insecticidal spray can also kill helpful bugs, so be careful. Only apply insecticidal spray in cool, still weather. Scale insects appear as tiny brown or orange discs on the underside of leaves or on the leaf stems. These pests are called scale insects because of the waxy coating or scale over their bodies. They feed by sucking sap. Yellowing leaves or sticky deposits can be a sign of scale as can stunted growth and discoloured or dropping leaves. Light infestations can be scraped off by hand. Heavier infestations may require insecticidal soap or products containing Pyrethrum. Thrips can cause purple spots on the leaves and dropped flower buds. Prune affected areas as soon as possible. These pests can also be treated with insecticidal soap, however, it can be more helpful to encourage beneficial insects that live on thrips such as lacewings and ladybirds. You could also apply neem oil to affected parts as soon as you see signs of damage. The root weevil can cause pale or yellowing leaves on your shrub. A severe infestation may require a chemical spray. You will need to spray the soil surrounding the plants in order to kill off weevil adults that may be lurking there. Nematodes are microscopic roundworms. They often thrive in the late spring and summer months but are killed off be very high or low temperatures. They are easily spread from one area to another by run-off water. Digging in organic matter to the soil around the plant will encourage beneficial bacteria which will keep the nematodes in check. Many gardeners find that planting marigolds around viburnum helps to prevent nematode infestations as the marigold roots repel them. Weevils chew on the edges of leaves causing unsightly damage. They are not usually a serious threat to the plant. You can apply an insecticidal spray to kill the adults. This will need repeating every 2-3 weeks to kill off successive generations. Viburnum borers have dark bodies with yellow markings and clear wings. The adult moths lay eggs in the lower parts of the plant. The caterpillars that emerge from these eggs crawl beneath the bark of the shrub. They feed on the wood before emerging as adults. 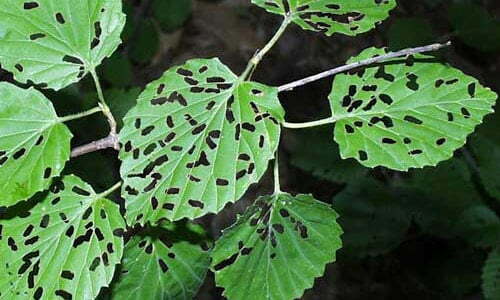 Borer damage can result in severe decline and even death of your viburnum. Keeping your viburnum healthy will reduce the likelihood of an attack. Ensure the soil is moist and well mulched. Remove weeds from close to the shrub and prune back damaged branches. Permethrin-based insecticides are effective against viburnum borers. However, its application will only be effective when the adults are flying. Leaf spot is a fungal disease that may cause blotchy patches on the leaves, especially during damp weather. To prevent the problem, water your plant in the morning to allow water on the leaves to evaporate. You can also thin out the branches to allow better air circulation. You can try spraying with a bicarbonate of soda solution using ½ teaspoon per 4 1/2 litres of water. For organic treatment, you can use treatments containing sulphur or copper octanoate. If this fails, you may want to use a fungicide. This is another fungus that can cause yellow leaves on viburnum as well as a white fungal growth under the bark. Proper plant care is critical in controlling this problem. Be sure to remove all weeds and debris from the surrounding area. If the plant is overcrowded then cut back or remove plants as necessary. Thinning out the branches of your shrub will allow for good air circulations which will reduce the risk of this fungus getting a hold. Q My viburnum has yellowing leaves. What might be causing this? There are several pests; such as aphids, and diseases; such as leaf spot that could be causing your viburnum’s leave to go yellow. (See pests and diseases). Alternatively, it may be a little dry. Try watering it more regularly and applying a mulch to the area around the base of the shrub. Q Despite regular fertilizing and daily watering, my viburnum is losing its leaves. What could be causing this? It sounds like your plant is being too well looked after. The dropping leaves may be down to fertiliser burn. I would stop fertilizing it completely for the next year. Also, you might be watering it too much. Unless the weather is very hot and dry, a good soaking twice a week should be enough. Q My viburnum won't bloom. What could be the problem? There are several potential reasons for your lack of blooms. Firstly, it may be that your viburnum is not getting enough sun. Most varieties need full sun to thrive though there are some that can tolerate semi-shade. Secondly, your shrub may be receiving too much nitrogen. Too much nitrogen will produce plenty of lush green growth but few flowers. If you are fertilising your plant you may want to stop or use something that does not contain nitrogen. If your viburnum is in or near a lawn, then the nitrogen you are using to fertilize the grass may be affecting your shrub. Once the existing nitrogen is used up your shrubs should start to bloom again. The third possible reason is that you are pruning at the wrong time of year. Viburnums bloom on old wood. This means that you should prune them immediately after flowering. If you trim off new growth it will not get a chance to produce flowers.